Various initiatives taken by the State Government under the Swachh Bharat Abhiyaan seemed to have failed as the Union Ministry of Housing and Urban Affairs (MoHUA) announced the rankings today. Indore has once again emerged as the overall ‘cleanest city' of the country, the third time in a row in the results declared by Hardeep Puri, Union Urban Affairs Minister, in New Delhi on Wednesday. The idea was to ensure no garbage or litter was found in any public, commercial or residential area except in the litter bins and 100 percent of solid waste generated was scientifically handled. The protocol was also to ensure a gradual reduction in waste generated and ensure the city's aesthetic beauty. This year, Union Minister Hardeep Singh Puri launched a 25-day "Swachh Survekshan 2019" survey in between 4th - 31st January 2019, covering 4,237 towns and cities in the country. The survey indicators/questionnaire carried a total of 5000 marks as compared to 4000 marks in Swachh Survekshan 2018. According to the Union Housing and Urban Affairs Ministry, the digital and paperless survey was the fourth edition of the annual cleanliness survey of "Urban India". The Swachh Survekshan concluded on January 31 with about 4,237 urban local bodies participating in the city ranking survey. This year's survey noticed 94 per cent achievement in Individual Household Latrine (IHHL) application target, 100 per cent of Community Toilets and Public Toilets targets, 89 per cent door-to-door collection, 60 per cent source segregation, and 52 per cent processing of waste from a mere 18 per cent in 2014 in the country. Where does Jammu stand in the list? 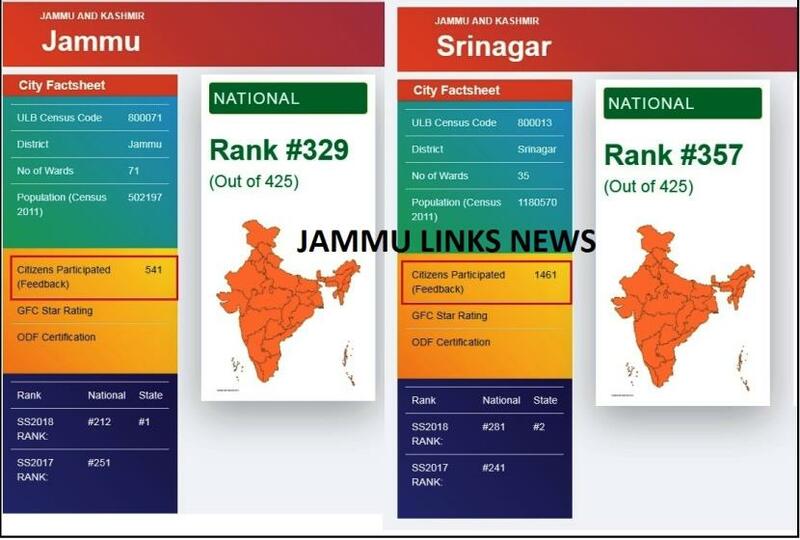 This year Jammu city sustained a severe blow as it received the worst ranking of all years slipping to 329th position in Swachh Survekshan 2019 out of 425 cities. This is a step down for the city which had stood 212th in the previous year's survey. Anantnag was adjudged as the cleanest city from the State, ranked at the 258th position. Tangmarg stood at 335th while Srinagar stood at the 357th position as compared to 281st in last year's ranking. The ranking for Jammu city has plummeted in this year's survey thus revealing the sanitation woes of the citizens. The concerned authorities have failed miserably in the pan-India survey. In Swachh Survekshan 2019, the state rank for Jammu and Kashmir was improved to 15th position as compared to 21st in last year's survey. After spending tons of money, municipal elections were conducted in the State following which Senior BJP leader Chander Mohan Gupta was elected as the new mayor of the Jammu Municipal Corporation (JMC) and Purnima Sharma was elected as the deputy mayor of the JMC in the month of November. Gupta pledged to work to make the winter capital of Jammu and Kashmir as one of the best cities in the country and vowed that his first priority will be to make Jammu one of the beautiful cities of the country and a better place for the residents. The tall claims made by the mayor seemed to have fallen flat today. Even after four months of getting a mayor, Jammu could not step up Swachh Survekshan 2019 ranking rather the rank plummeted further. Jammu Links News contacted JMC Mayor, Chander Mohan Gupta for his response on Jammu city's poor performance in the survey. He said, "We were not provided any funds to initiate programmes for cleaning the city or aware the local populace for the same. It is disheartening but I am not responsible for it." Earlier, Jammu Links News had appealed the citizens to take part in the digital survey owing to the lack of effort from the municipal department. It was almost impossible for Jammu to improve its rank considering the lackadaisical approach of the Jammu Municipal Corporation towards the survey. The digital involvement of citizens was of prime importance in this year's survey yet no strong efforts were made by the JMC department to motivate people for the same. In this digital age, it is disheartening to witness such a lack of enthusiasm from the authorities. The charts given below illustrate the insufficient public support owing to lack of awareness. In the year 2018, people still took an initiative to vote for making Jammu stand out among other cities. Although we have not made it to the top 100 clean cities but we hope that the concerned department will up their game to make Jammu a clean city and keep their promises in the future.